I took this photo on Monday evening, after an emotional weekend. My nearly 5-year-old son was sitting on our deck singing his favorite new song: “I Have Peace Like a River, I Have Love Like an Ocean” (so cute!). 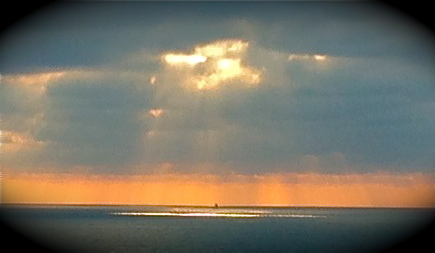 I looked up and saw this sailboat sailing into a tiny spotlight of light, breaking through rain clouds over the Pacific Ocean. I knew instantly that it was the perfect metaphor for me as of late. Perhaps it’s all the long hours of yoga teacher training? Or, maybe it’s all the hip opening we’ve been doing lately? But something is breaking down walls. I find that in this past month of intensive training, I’m opening up my heart more than ever and releasing a roller coaster of emotions and long-lost memories. During a particularly long hip opening called frog pose (not advisable for newbies! ), a memory of my ex-husband popped into my head. It was in the middle of the night four and a half years ago. He had gone to the nursery, changed our infant baby’s diaper and was humming as he walked back into our room. He handed the little burrito to me in bed so I could nurse him back to sleep. He kissed the baby’s head and mine, before turning back in. It was such a sweet memory. After our six hour training session this Saturday, I thought about what other memories had been popping up lately. Some have been hard, from my childhood that was an ever-shifting alcohol-fueled tide. But some sweet too. One was of my dad, laughing and teasing me and one of my best friends he liked to call Beastie. I had forgotten how he would tease my girl and boy-friends in such silly ways. What I’m realizing, as I mellow, is that it’s just as critical to recall the good along with the bad memories from those who have let me down. We are all such multi-faceted beings. Even those who have hurt me tremendously, have also been kind, silly and tender at times. This can be confusing, but for me, it helps as I piece together my past that for the longest time felt like shifting sands. It’s hard to leap forward with confidence, when the past resembles a shaking, evolving platform. I think the hard part of recovering from a divorce, or any betrayal or lies, is the internal confusion that grows. As I discovered the truth about events in my marriage, and even in my childhood, I started to question my ability to discern just what is real, or what was felt, or what can be trusted by others. That’s why light bulbs flashed for me while reading an article by psychiatrist Anna Fels on Sunday. Apparently, many other people felt the same way, as her New York Times editorial Great Betrayals was the fifth most viral news article on the Internet that day. Dr. Fels explains eloquently why it’s so hard for those of us who have had been lied to, to move on successfully. We no longer have trust in our memories—in the narrative of our life. This erodes into a patchy, mental foundation, as we begin to mistrust what we see or hear or even experience in the present. In order to move forward, we have to put together the narrative of our past. And this takes courage and time to put the whole story line back together. It takes courage to own the good and bad times—regardless of what else might have been happening. And perhaps that part can only come after forgiveness truly settles in. At least, that’s how I see it. Dr. Fels simply explains that the person who does the lying or betrayal can recover more easily as they have an intact past. This person knows exactly what she or he did and felt. And if remorseful, can recover faster and step forward refreshed and determined to begin a new. Typically, they garner more support, too, as everyone loves a come-back story. The psychiatrist gave many examples of betrayal, including a client who hid a massive debt from his partner for years. The part of betrayal that hurts the most are always the lies. They eat away at the fabric of your past reality and the ability to trust what you sew in the future. For instance, a friend who has been divorced several years is still discovering more lies and betrayals from her ex. The continual drip of new information from friends and family keeps her on edge. Just what was real from their marriage? When they were on vacation did he mean what he said? They had a lot of fun times, did he not share them? Were they not real? When he wanted to venture into another business abroad, was another woman in the picture then, too? And what about their many friends who knew? Should she trust them now? As I read this article, I felt a wave of compassion roll over me like a mother rocking her child and saying “there, there.” Piecing together the past is arduous. I loved that Dr. Fels reminds readers that the people who are lied to are NOT naive for trusting their partners and they were not” in denial and knew on some level”—both sentiments that misguided friends and family often say to the person in pain. The psychiatrist explains that friends become queasy about the lack of control victims of betrayal have—often making them to be less supportive or critical. Dr. Fels’ article, (without specifically stating it) reminds ALL of us to seek compassion. Life is messy. We are all multi-faceted and none of us are perfect. The person who is struggling to piece together their own narrative, especially, needs to find compassion for themselves. It’s okay if you don’t move on immediately or always behave with grace and forgiveness. This is hard work. I feel blessed to finally be on the other side. And as waves of good memories start flooding in, I’m starting to own them. At first it confused me into thinking I wanted to return to my old life. There were many good times, after all. But now I know it’s just a way for me to be grateful for what I had and how I’m growing in my awareness and in my capacity for forgiveness and compassion. (And this includes for myself.) There were plenty of times when I might have been overly critical and less grateful than I am now. I’m owning them too—and moving on. But most importantly, when I recall a memory where I felt love and security, when in light of discovered events, it likely wasn’t reciprocated, I now allow it to be ok. I felt it. I lived it. And that memory can be owned, too. One person’s actions doesn’t necessarily negate your own feelings or hopes. And they shouldn’t be an excuse to shut down, and not trust or dare to love again. But it just takes time—and more importantly, it takes compassion.